Sited on a deep, narrow lot, tucked out of view from the street, this grand farmhouse-style home seems to be hiding from the city around it. It’s so private, you’d be unlikely to guess that it sits in the middle of Atlanta, one of the country’s booming metropolises. A large kitchen and a fully stocked wine cellar cater to the homeowners’ passion for cooking and collecting wine together, while the rest of the home supports the close-knit family’s active lifestyle with the best of today’s creature comforts and traditional styling. 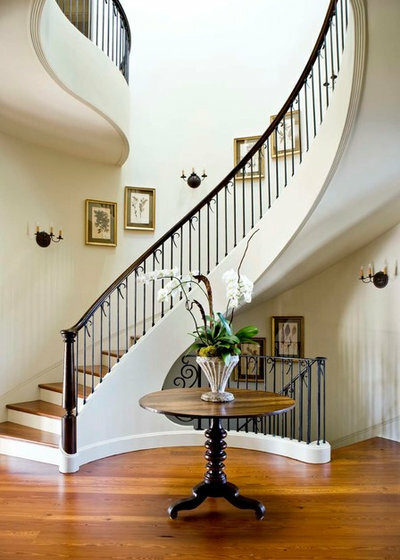 The home’s entryway sets a formal tone with a rotunda ceiling, an antique table and a curved staircase adorned with custom iron railing by Atlanta-based metalworker Charles Calhoun. 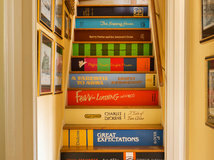 The staircase is dramatic, but its simple lines are graceful and unfussy. Elegant sconces and picture frames establish the classic antique feel that extends into the adjoining dining room. 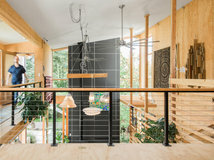 The octagonal dining room features a rich green color intended to connect to the property’s lush landscaping outside the window. Green wool draperies match the walls so that the space wouldn’t look chopped up by too many color breaks. Rather than finding an antique dining set, designer Barbara Westbrook reupholstered new chairs in a classic Clarence House tapestry fabric. The Paul Ferrante chandelier was another new construction by an artisan who specializes in antique-inspired pieces with beautiful custom finishes. The husband’s office is just off the library. Since he often works from home, it was important to give him a space that felt comfortable and conducive to work. 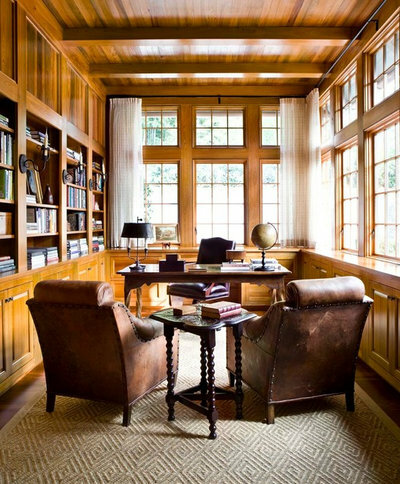 Westbrook achieved this by paneling the walls in cypress and placing his desk with a view of the side garden. Since the room gets a lot of sun, she chose a sheer drapery fabric that would filter the sunlight without blocking the view. 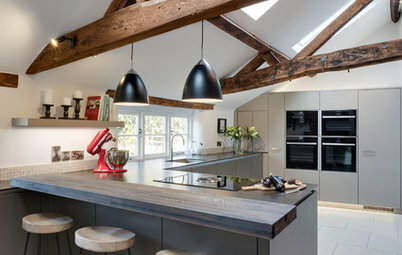 Creating a large kitchen with multiple functions was a priority for the homeowners, and they had a clear vision for use and labor. Since the kitchen opens to the family room, the parents can keep an eye on the girls and line them up at the island for breakfast and lunch. The owners do their dinner prep on the thick walnut butcher block countertop and had most of their heavy-duty appliances installed on that side of the kitchen. 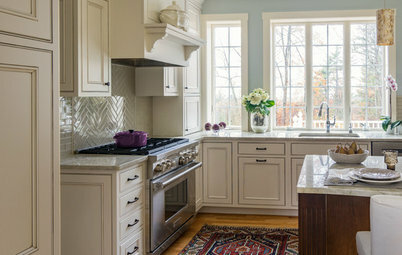 Behind the beadboard walls and cooking niches to the left of the photo are touch-latch cabinets. 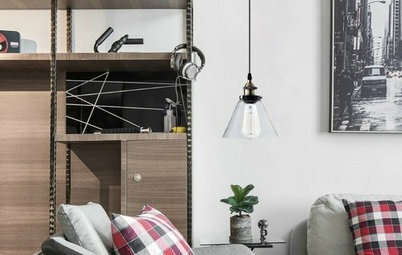 “Instead of having cabinet doors everywhere, the board walls unify the space where the range is and gives the family some long-term storage,” Westbrook says. 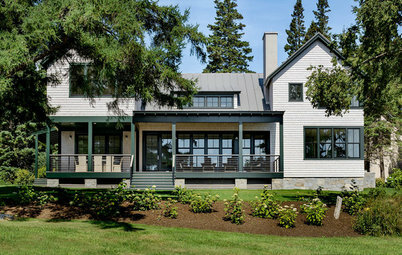 Those beadboard walls hide the pantry and the built-in fridge and freezer too. 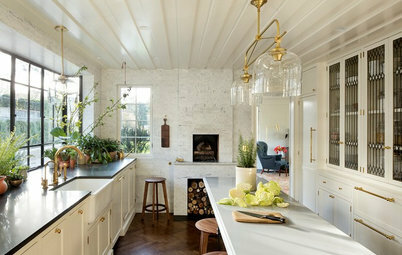 The designer also broke up the cabinetry in the large kitchen by adding leaded-glass doors to the tall cabinets on both sides of the window. Beyond the kitchen, overlooking the motor court at the front of the house, is the breakfast area. The space is lit by another Paul Ferrante light fixture, and a checkered fabric covering the chairs adds another layer of classic Americana. 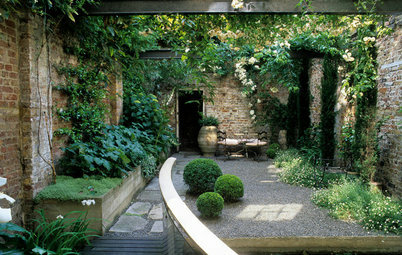 Iron doors provide access to an exterior nook shaded by an overhang and plantings. 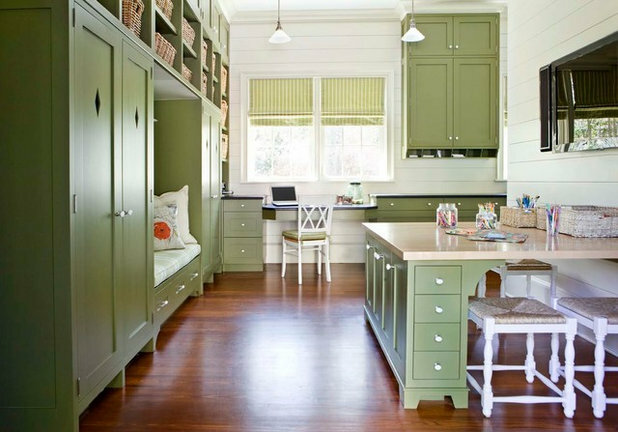 Also facing the kitchen is the family room, which draws from the same green color scheme as the dining room, but with “fresher” tones. 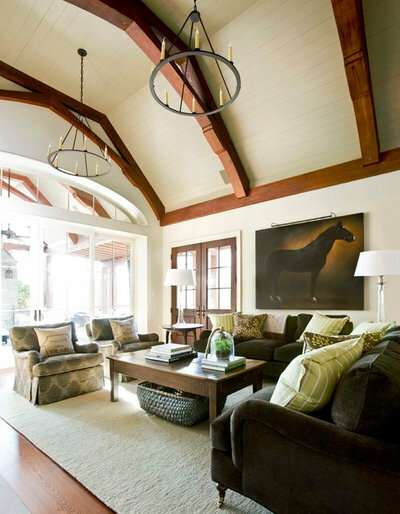 On the wall above the sofa is a painting by James McLaughlin Way, an artist known for his large-scale paintings of horses. 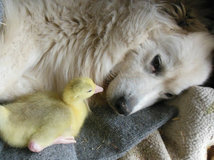 His painting is one of many throughout the house that takes barnyard animals as its subject, a nod to the home’s farmhouse vibe. Achieving an efficient flow throughout the first floor was essential to the design process. 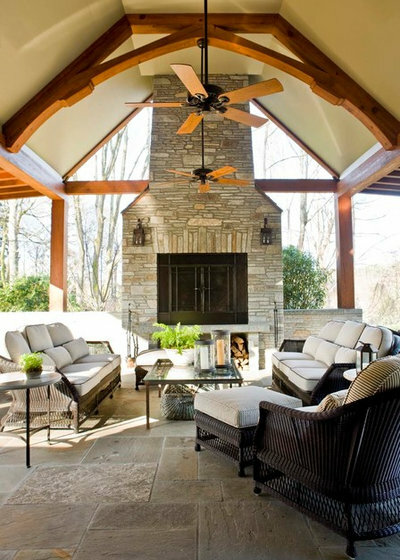 Large glass doors in the family room fold back to open the room to a gracious outdoor porch where the family grills together and relaxes by the fireplace, creating an unobstructed line of sight from the kitchen to the porch. The window treatments feature a subtle leaf pattern. The paneled drapes on the canopy bed add another layer of softness. 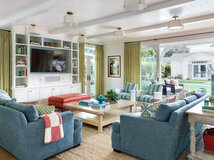 The room’s arched ceiling creates a lot of volume, so it was important for Westbrook to use enough fabric to make the heady space feel comfortable. The hand-woven area rug’s nubby wool adds additional texture. A reproduction chandelier and a pair of wing chairs with turned legs reinforce the antique feel the owners love. 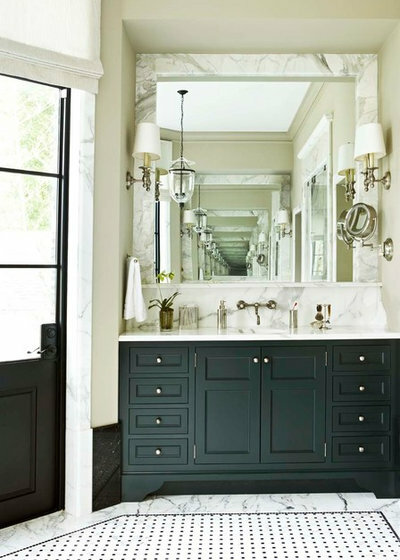 The couple’s principal request for their irregularly shaped master bathroom was that it contain a double vanity. They loved the mosaic pattern selected for the bathroom floor, so they pulled black and white as the primary accent colors. Overscale black marble baseboards wrap around the room, and another variety of marble trims the doors and windows. Motorized shades hidden in pockets above the doors and windows can be lowered when the owners want absolute privacy. The room is on the main floor but opens to a private backyard. Westbrook also used marble to frame the mirrors for consistency of detail. She carefully chose every detail — like the layout of the multiple body sprays in the shower and the height of the wall-mounted sink faucets — to ensure that each fixture would be comfortably accessible. Pictured here is the older daughter’s room. The window treatments are done in a quiltlike fabric with little red ties to match the duvet. “It’s these details that bring everything together,” Westbrook says. Each girl chose her own color palette, but they have the same upholstered bed frame, which they picked to match each other. Each girl has her own en suite bathroom. “Kids’ bathrooms can be a little more fun and charming,” Westbrook says. But the family didn’t want anything too juvenile. 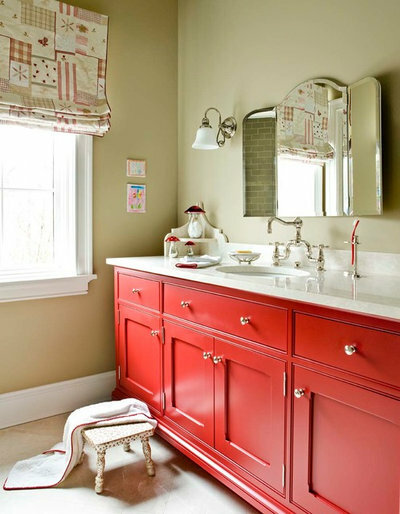 The red cabinets are “less serious” and a perfect foil to the Matouk towels, with their red welting. 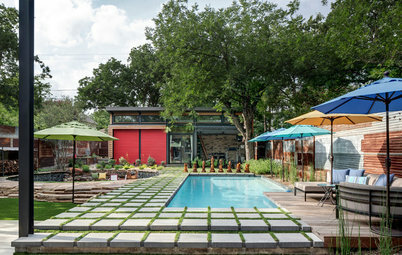 The designer uses the same towels in her own home, trimmed in a different color. Off the garage, this multipurpose room acts as a mudroom and transition space, with lockers on both sides of the daybed for school bags. Originally designed as a craft room for the girls, the room contains a little desk under the window where the wife also does a lot of paperwork for the family business. The basement wine cellar feels like “walking into a wine barrel,” Westbrook says. 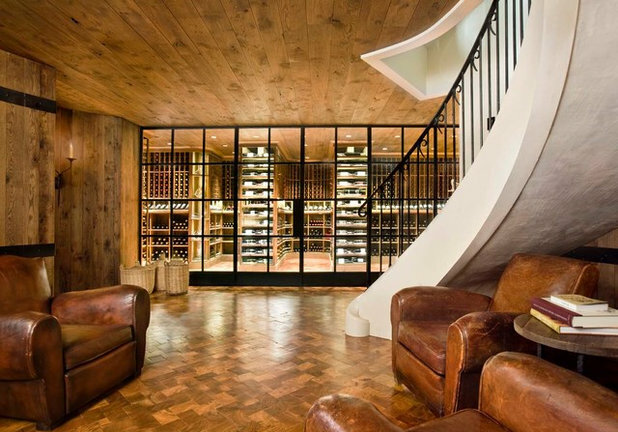 Indeed, the vision of floor-to-ceiling wine bottles behind a glass wall was intended to be as dramatic as the staircase. Hard pine panels the walls and the ceiling. The floor features end-cuts that really show off the wood grain. Instead of a typical tasting table, Westbrook furnished the room with four vintage French leather chairs to anchor the space and to offer more comfort for lounging and sipping wine with guests. More plantation than farmhouse style. 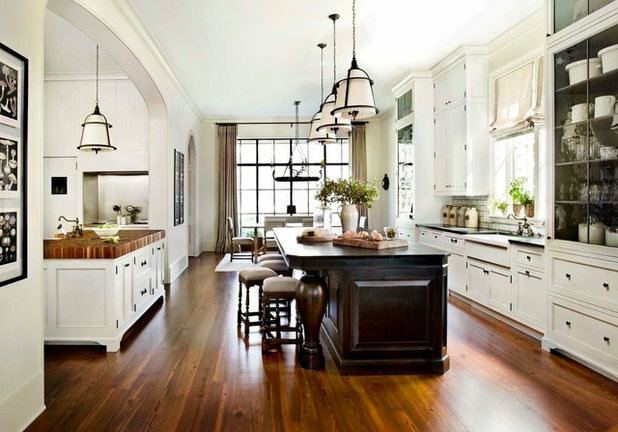 Love those kitchen light fixtures.